View cart “CBD Oil” has been added to your cart. Natural CBD from pure Dutch hemp grown for fibre. 100% natural origin. Get the CBD oil display free with purchase of 12 bottles CBD oil. Read more about the quality under the tab 'quality'. Use: 2x per day, 2 drops, keep under the tongue for 1 minute and then swallow. Increase dosage slowly. Max. 15 drops per day. Shake before use. Do not use if pregnant or breast-feeding. Do not spill, as it will stain skin and clothing. 2x per day, 2 drops, keep under the tongue for 1 minute and then swallow. Increase dosage slowly. Max. 15 drops per day. Shake before use. Do not use if pregnant or breast-feeding. Do not spill, as it will stain skin and clothing. A food supplement is not a replacement for a varied diet. A healthy lifestyle and a varied, balanced diet is essential. Store at room temperature, out of reach of children. Limited shelf life after opening. According to EC Directives 2000/13, 2003/89, 2005/26, 2005/63, 2006/142, 2007/68 and updates. European legislation was adopted in 2012 relating to nutrition and health claims made on foods (the Commission Regulation). The Commission Regulation is a European Regulation (432/2012) which sets out what information may be provided regarding the effect of vitamins, minerals and other nutrients on products (on packaging, labels, websites, advertisements, in brochures, books and on social media). Only approved health claims may be made. These claims provide information about the effect a particular ingredient has on health. Approved health claims are recommended by the European Food Safety Authority (EFSA). For many years, it was possible for companies to submit health claims, but unfortunately very few of them were approved. Because many of the claims submitted were rejected, some nutrients have no approved claims which relate to them. Food supplements are not a medication and may only promote health. This means medical claims can never be made in relation to supplements. We all enjoy free speech, and it is possible to make claims about the effect of certain nutrients in articles and brochures and on websites, but in this case there should be no advertising of a specific product or any reference made to it. Public advertising of self-care medicines, medical (self-care) aids or health products is in the interest of public health, though it does require clear regulations. Industry, the media and advertisers recognise their social responsibilities, and have created rules with which public advertising must comply. These rules are drawn up by the Dutch Foundation for Monitoring Medicinal Product Advertising (KOAG) and the Dutch Foundation for the Promotion of Health Products (KAG). On behalf of the KOAG and KAG, the Inspection Board monitors the public advertising of medicines, medical (self-care) aids and health products. Companies can have their claims verified by KOAG KAG. If a claim is verified and permitted, the company is given an approval number. This can be found on claims made in, e.g., brochures. 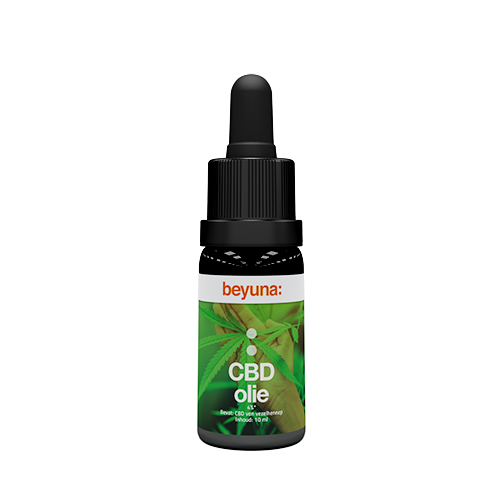 Beyuna's CBD oil consists of 3% CBD, 1% CBD-A and hemp seed oil. CBD stands for cannabidiol and humans also have an endo-cannabinoid system. Endo means 'internal': these are the body's own cannabinoids. Endocannabinoids (the body's own cannabinoids) are almost identical to phytocannabinoids (plant-derived cannabinoids). Therefore, your body handles plant-derived cannabinoids very easily. The compounds connect to the same receptors. Beyuna CBD oil is of very reliable quality and doesn't contain THC, the psycho-active substance in hemp. You will therefore not get high on Beyuna CBD oil and it is safe to use. CBD is extracted from pure Dutch hemp grown in the Netherlands. CBD is extracted from the hemp plant by means of CO2 extraction. This doesn't involve any heating; only CO2 pressure is used to extract the substances from the plant material. This is a delicate and clean extraction that optimally preserves the cannabinoids. CO2 extraction gives the CBD oil a somewhat sharper, spicy flavour. This CBD oil is also called CBD oil Raw and is a cloudy brown colour. CBD Oil Raw has the property of being thicker in texture. The reason for this is that during CO2 extraction, a greater quantity of natural plant material remains in the hemp paste. When the bottle is in a cold environment, the oil can become a little thicker and even syrupy in texture. Therefore, store the bottle at room temperature and, if desired, near a radiator. The heat will keep the CBD Oil Raw in liquid form. CBD paste is mixed with oil from the hemp seeds which have been carefully cold-pressed to produce the oil. This preserves the essential ingredients. Beyuna CBD oil contains no additives. 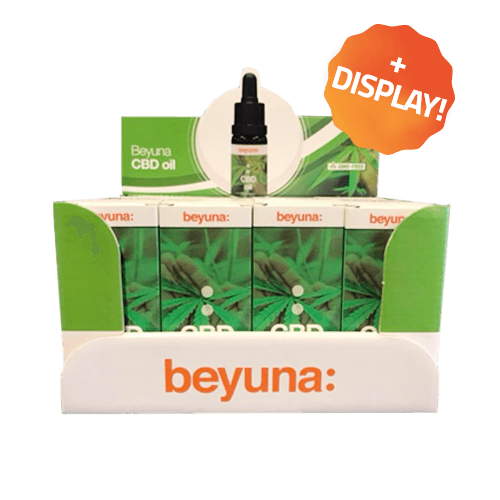 Beyuna CBD oil comes in a dark glass bottle with a pipette for convenient dosing. Store the CBD oil in a dark place.